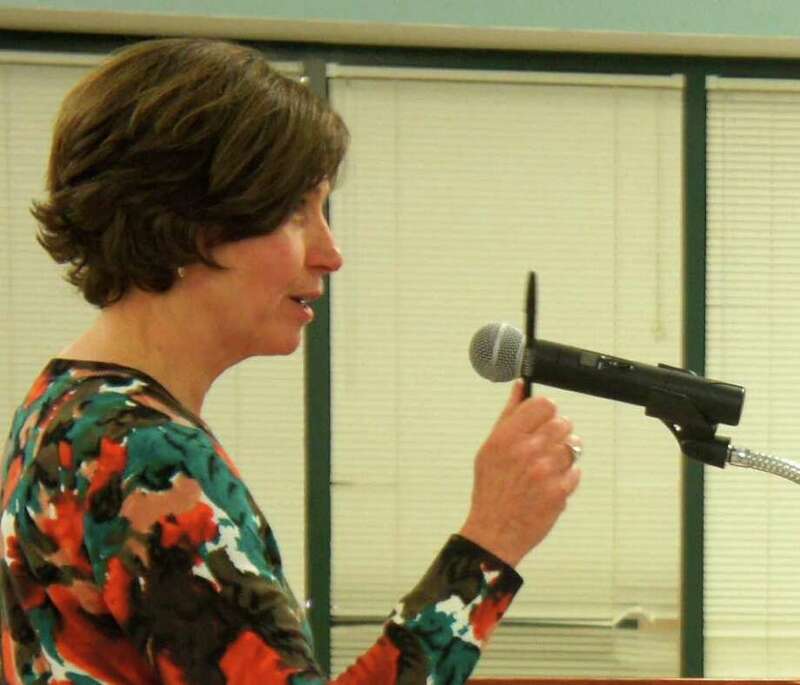 Katie Augustyn, a board member of the Connecticut Association for the Gifted, addresses Monday night's meeting of the Westport Board of Education. Westport school administrators told the Board of Education on Monday that they intend to move ahead with changes to the district's "Workshop" program for gifted students. Members of the Workshop Curriculum Committee outlined a series of recommendations that seek to further integrate the curricula in gifted and regular education classes, create more personalized education plans for gifted students and improve teachers' instruction and management of gifted pupils. "The recommendations that we're making take steps to make gifted education an integral part of the school linked to the central mission of the school, entwining it with the regular education curriculum that is so rich and complex and that Westport is so proud of," said Assistant Director of Pupil Services Michael Rizzo. The Workshop Curriculum Committee, which includes several Westport public school administrators, was formed earlier this year after school officials reviewed feedback from a parent survey and student focus groups and issued several recommendations for the gifted program. Approximately 165 students in grades three through eight participate in the Workshop program, which provides specialized education to gifted pupils. Second-grade students are identified for possible entry into the program through a series of assessments. Creating a "mainstream articulation plan," which educators would use to plan each gifted student's curriculum, is one of the leading recommendations of the committee. To complement that proposal, committee members also advocated that gifted students' academic progress be tracked by performance-based assessments with detailed rubrics. To foster more integration of curricula, the committee proposes that teachers of gifted students and instructors of students in standard classes collaborate on lesson implementation and individualization of their students' areas of study. The Workshop Curriculum Committee will also study instituting cluster grouping, a framework in which usually four or more gifted students are placed in the same regular classes. After its recommendations are implemented, the committee recommends that the school district conduct a full review of the Workshop program at the end of the 2012-13 academic year. Other measures backed by the committee, such as staff development of gifted education faculty and increased interaction among gifted students from different schools in the district, have already taken effect. Several school board members expressed support for the committee's proposals. "I'm very excited by the overarching theme of really helping to reach out and stretch each and every one of our students," said Elaine Whitney. "I think your recommendations will help those who have been formally identified as well as many high-achieving students who haven't been formally identified." Since last year, the school district has also implemented a new long-term curriculum initiative, Westport Education 2025, as well as a new math program, Singapore Math, for students in kindergarten, first grade and second grade. Lis Comm, director of secondary education, professional development and research, said district educators aimed for the objectives of the Workshop program to align with the goals of 2025. "We're concerned with critical thinking and problem-solving. We're concerned with collaboration; we're concerned with making kids entrepreneurial," she said. "We want to create a curriculum for the gifted students, which will help them develop these 21st century skills." Dozens of parents attended Monday's board meeting, and many voiced a range of views about the Workshop program. "We are now proud to be talking about this; we are proud to be making improvements," said Katie Augustyn, a board member of the nonprofit organization, the Connecticut Association for the Gifted. "I think there is a lot that has happened and a lot that still could happen." Some parents, however, expressed dissatisfaction with the school district's management of the Workshop program. "Despite some really talented teachers and administrators, we're doing a relatively poor job serving not only our relatively few gifted kids, but also a larger range of high-achieving kids," said Jim Westphal. After several board members indicated that they favor changes to the gifted program that would be "budget-neutral," some parents called for the board to consider allocating more funding for the program. "Let's not get caught up in the constraints and confines of budget neutrality," said Mandar Mudholkar. "Let's talk about the prioritization and see whether we can bring this program to a higher standard." Some parents also recommended that subject-specific accelerated programs be instituted for gifted and high-achieving students in grades three through five. In math, however, the school district will not implement that suggestion because school officials are seeking to expand Singapore Math next year to the third and fourth grades. The Workshop Curriculum Committee will next meet with the Board of Education to review the identification process for prospective Workshop program students and the potential implementation of cluster grouping. Board of Education members have not yet decided whether to vote on any of the Workshop Curriculum Committee's recommendations, the board's chairman, Don O'Day, told the Westport News.